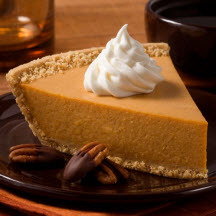 Start a new holiday tradition with this easy, creamy no-bake pumpkin pie. Sprinkle gelatin over water in small saucepan. Let stand 1 minute. Cook and stir on low heat until gelatin dissolves. Combine pumpkin, sweetened condensed milk and pumpkin pie spice with wire whisk until well blended. Stir in gelatin mixture. Let cool 10 minutes. Gently stir in whipped cream. Pour mixture into crust. Chill at least 3 hours, or until set. Serve individual slices topped with whipped cream, if desired. Nutritional Information Per Serving (1/10 of recipe without topping): Calories 302; Fat 12g; Cholesterol 14; Protein 6g; Saturated Fat 4g; Trans Fat 0g; Sodium 328mg; Carbohydrates 46g; Sugar 35g; Iron 0%; Fiber 0%; Calcium 0%.